On October 6, 2011, a Chilean appeals court lifted a suspension order that will allow the construction of the HidroAysén hydropower project to proceed. The appeals court had ordered the suspension in June after a petition for an injunction was filed by the environmental organization Patagonia Sin Represas (Patagonia Without Dams). HidroAysén is a USD 3.5 billion project that aims to build five dams on the Baker and Pascua River in Aysén, a pristine environment in the Patagonia region in southern Chile known for its glaciers and lakes. The joint venture includes Endesa (a Spanish company owned by the Italian state company Enel) and the Chilean company, Colbún. The project consists of the construction of two dams on the Baker River and three on the Pascua River, which the company claims, will generate 2,750 megawatts (about thirty five percent of Chile’s total energy needs). The energy would travel over a grid of three hundred kilometers of high-voltage power lines from Aysén to the north of the country, where the country’s major cities are located. At a cost of around USD 4 billion, the grid would affect thousands of public and private properties in nine regions of Chile. 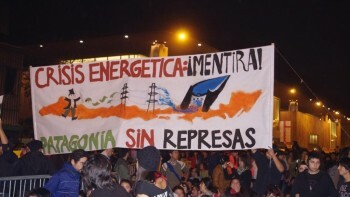 Endesa owns eighty percent of the water rights in Chile; in fact eighty five percent of the country’s bodies of water (rivers and lakes) no longer belong to the government. In 1981, then-dictator Augusto Pinochet approved the Water Code law (Código de Aguas) which established that the nation’s water was not public property, but rather private property. The law essentially said that the Chile’s water was a commodity with a commercial value, like a house and as such, its owners were free to lease , use, or sell it. Sebastián Piñera’s administration has supported the project because of the country’s need for greater amounts of energy at the lowest possible prices to support its economic growth. In fact, with its energy-intensive mining industry and heightened standard of living, some analysts suggest that Chile will need to triple its energy capacity in the next fifteen years. Chile has little oil or natural gas and imports ninety seven percent of its fossil fuels, thereby depending largely on hydropower electricity. Furthermore, in light of the recent earthquakes in both Japan and Chile, the nuclear energy option has been abandoned. The energy system in Chile is extremely fragile and, according to the government, the HidroAysén dam would be one of the safest energy source for the country. Opponents argue that the dam would, in fact, flood fourteen thousand acres, eliminating whitewater rapids and waterfalls that attract ecotourism. Critics of the dam instead want the government to focus on improving energy efficiency and developing renewable sources. Chile currently gets less than five percent of its electricity from renewable sources, but the country has an untapped abundant renewable-energy potential from the sun in its northern deserts, wind all along the pacific coast, geothermal sites and biomass from agricultural areas. Local opponents of the dam project are supported by international personalities like Robert F. Kennedy Jr., the senior attorney for the U.S. Natural Resources Defense Council, who has appealed to President Piñera to call off the project. The environmental organizations are expected to continue their fight against the HidroAysén project, but realistically, only the Italian state, which holds thirty-two percent of Enel’s stock, could stop the project. The Chilean government seems to have no legal right to halt it, because according to the Código de Aguas, once the water rights are given to an individual or a private company, the state cannot intervene. and the owners of the water rights are only required to declare where and when they will use the water, and their intended purpose. The role of the government is little more than monitoring the projects that these companies carry out.